If the rumors are right, Microsoft has decided to cancel the second version of the HoloLens, and they will instead move onto version three of their mixed reality headset. In the latest report, Thurrott's Brad Sams states that the expected release date of this new Windows Holographic device wouldn't be until 2019, a long two years away for those of us putting full effort into HoloLens app development. Now, to reiterate, this is just a rumor, so take it with a grain of salt. Anonymous sources can't always be trusted. However, Senior Project Manager at Microsoft, Kayla Kinnunen, a producer, designer, and developer of virtual and other next reality experiences, may have confirmed this rumor recently on Twitter, though she could be talking about something else altogether. With that out of the way, let's unpack this rumor from the perspective of a Windows Holographic developer and see what substance we can find in it. With the only mixed reality headset available to the general public currently, Microsoft has the lead in this market. While the headset is considered a developers kit, it has been opened up to the public to purchase. Of course, it has a hefty price tag, and lacks applications that are more robust than just demos, which makes it hard for Joe Consumer to justify running out and buying one. It's been known that a consumer version is not a top priority, and would not be for some time. Back in July 2015, before the initial release of the HoloLens developers kit, Microsoft CEO Satya Nadella gave us a slight hint of a roadmap when he said it was going to be "a five-year journey" from developer versions to commercial use cases. "We'll get [the developer kit] out next year, and we'll iterate from there," he said in September 2015 at the Dreamforce conference. The assumed plan being to allow developers to design software for enterprises with the first version, and then, as the biggest mixed reality problems get solved, move toward a consumer edition. Since the initial development kit release, a number of potential contenders to the HoloLens have entered the ring. Magic Leap, Meta 2, ODG smartglasses, and many other devices are currently in the works, and there's also Robert Scoble's constant insistence that Apple is working on their own device. To stay competitive, Microsoft, while leading the way as they currently are, will need a roadmap to follow, or goals to hit. They also need to stay flexible in light of how the market forms. As the Magic Leap hype train continues to stir up both good and bad rumors, the Microsoft leadership will have to look and determine what is hype, what is real, and what steps are necessary to leave the mark they want to leave on future mixed reality users. So while there is an air of disappointment around this rumor, many mixed reality fans, myself included, were hoping that Microsoft would move a little faster than five years to establish a stronger foothold. But let's be real—the surprise here should be that there was an iteration that had potentially been set for production, not that it was canceled in light of changes to market expectations and needs. 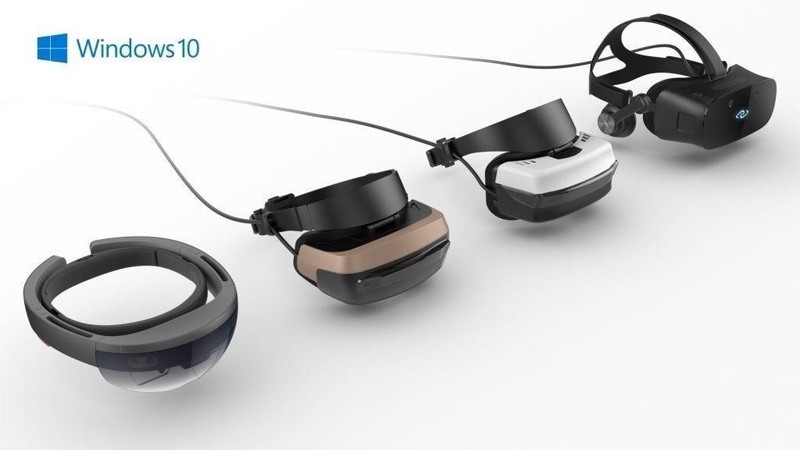 One step Microsoft has taken toward this eventuality was adding a set of new occluded headsets made by manufacturing partners, with development editions being released next month and a year-end release to the public. This mixture of occluded (headsets that cover your view of the outside world) and non-occluded (headsets that allow you to see the world around you while augmenting your view) devices will help further establish Windows Holographic as the platform for holographic shared experiences. We would all love to see a much smaller form factor, which is likely a high priority for Microsoft. From a consumer standpoint, it might not take off until it looks like a pair of glasses, but as developers, would we be content if the HoloLens's size is shaved down considerably and the unit has less or the same amount of processing power? Moore's law only pushes our technology so far. The are many developers out there like me, working on HoloLens or Windows Holographic projects full-time—or nearly full-time now—so I wanted to see what a few of them thought about this news from Microsoft. Although we were looking forward to the second version of HoloLens, we at Kazendi agree with Microsoft that HoloLens is the current leader in the Mixed Reality space, and in order for it to truly revolutionise the computer interface, it will need to go through more internal iterations. One of the most mentioned feedbacks from our clients is, for instance, to have the ability to use HoloLens with hard hats and safety glasses. You can just imagine the benefits for construction workers. This would be a fundamental change in the form factor and we hope to see this in version three. I think short term it hurts. It's going to be harder to get adoption of the platform with an extended out roadmap for anything that looks like a true commercial or consumer version. Long term, I think it helps, in that the next release should have some real fixes and new features in it, rather than a typical v2 rev, which often is just an updated chipset and some performance gain. The Holographic Platform is where we are going to see major strides in the next 12 months. Initially, but I think that's more of a cost to market for non-occluded, not because that's where they want it to go. The reality is, in order for the platform to survive, they need to get people using it. In order for that to happen, they need to make the cost of entry low. So you can't have an $800 headset that needs a $1200+ computer to run it and have it be consumer viable. The Vive and Rift are amazing, but the barrier to entry is too high. So, to get mass uptake on it, we are going to naturally see a shift to the occluded headsets that will be $299 and can run on most people's regular computers. The nice thing is, an app that runs on a Holographic platform will run on both an occluded headset, a non-occluded, or any other combination that we have not thought up yet. As a developer, I can develop for the lowest common denominator, and it will just work. And then if I want to take advantage of some feature that isn't available on an occluded headset, I can use some API calls to enhance my app for the headset I am targeting. Microsoft has become one of if not the best technology companies I have ever experienced, in terms of customer service, listening to their customer base, and pivoting in response to what they hear. They seem far more agile and responsive than most companies their size. With the HoloLens out in the world for nearly a year, with "thousands" of developers, as Alex Kipman put it, Microsoft is getting a good deal of feedback from the current user base. They can either respond to the user base wants and needs, respond to the marketplace, or a mixture of both. At this point, Microsoft has gained enough feedback to know whether their second iteration of the device will make the impact that they are hoping for. From this point, as developers, we watch and wait, keep our eyes on the prize, and dig in for the long haul. Those of us that are banking on Microsoft to win this race can keep working and build for the system in general. In a few weeks, we can start building software that will work for both the occluded and non-occluded devices and expand outward from there. Are you disappointed in these rumors? Do you think this is good news? Let us know in the comments below. I actually think this is a very smart move. As a HoloLens developer I would have to had to bought 2 new units for likely about the same price. Clients would hold off on purchasing units amidst rumors of a V2 sometime, maybe, possibly this year. Clients who would have considered V2 this year would also have thought "will there be an equally as expensive V3 in 2018?". This would have caused them to wait as this is a costly device to update each year. Especially important is the FOV. If this issue was not addressed with V2 (And Microsoft has said it would not be addressed anytime soon) all other features and improvements would have been of minimal effect in comparison. The FOV must be expanded to a similar range of Meta. The small FOV has cost me potential clients already. I believe Microsoft understands HoloLens is a longer term play and a lack of competition allows them to make the next version compelling rather than incremental. I believe that this move to skip version 2 is more to make room for the occluded headsets to build a market and allow for a consumer bridge from Virtual Reality to Augmented Virtual Reality to Mixed Reality. This will give the consumer market a chance to experience something close to MR with out the price tag. From a developers stand point, I believe that it will be more about a shared reality with holographic imagery. Imagine, with one or two primary HoloLens and a collection of holographic headsets, larger and larger groups can have the same experience. Like Master-Slave scenarios. I think it is important to note that OEMs aren't confined to VR headsets running Windows Holographic. They can create HoloLens type products as well. What I think Microsoft has done for this year and the next is leave the gap for OEMs to fill in. With the VR headsets from Lenovo, Dell, HP Acer and Project Alloy. But there's also the likelihood that Microsoft has given away V2 to OEMs and have those PC OEMs develop their HoloLens Clones to fill the gap and sell to developers. This is probably likely what they have done. I can completely understand the "let the OEMs handle it" mindset. It seems to be Microsoft's play these days. Show everyone how it is done with the top end product like the Surface and then the OEMs will follow.